A Curbed reader dropped this missive in the Curbed Inbox late yesterday to share a few choice words about Cubix, SoMa's most talked about all-studio development. On my way to Whole Paycheck today, I stopped in to Cubix to check out some of their model units. Now, I knew they were small, but for some reason I was not expecting them to FEEL so small. The finishes were fancy, sure, but they could not make up for the oppressively claustrophobic size . Privacy is also pretty low. 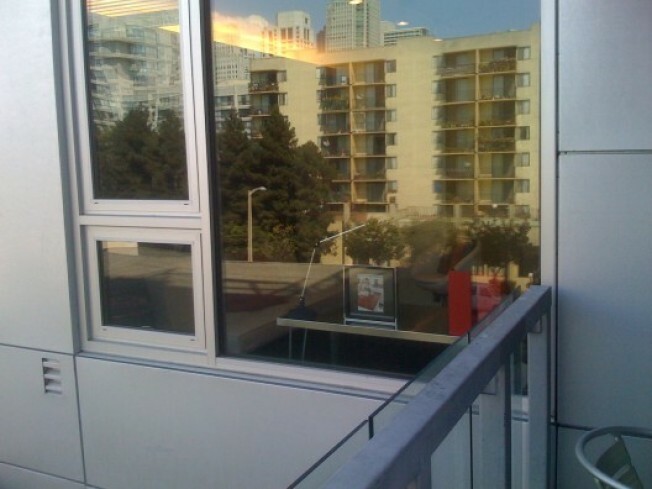 Any corner unit looks right into the other corner unit and many share small balconies. You would have to keep the blinds down all the time, definitely. Hopefully these iPhone pics that hopefully show just how jammed together the space is. Total flashback to freshman year here. I half expected to see a sock or tie on the door knobs. Awesome dorm, terrible condo. Ok, then. So who can tell us what makes Cubix irresistible, then? Price? Rent-ability?